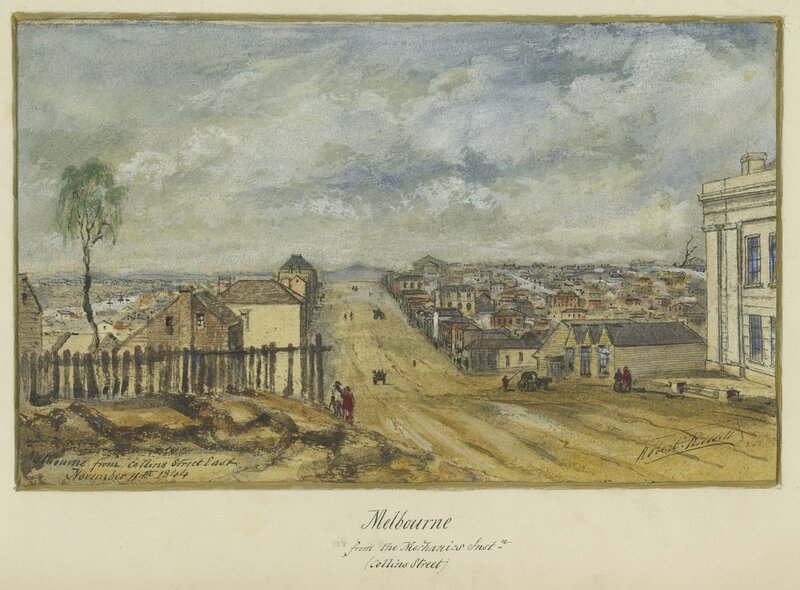 MELBOURNE 1841 by John Adamson Image Courtesy of the State Library of Victoria, Image no. H6262/2. 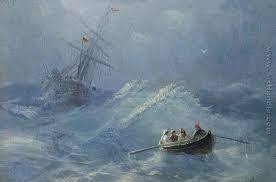 So, after selling off all their earthly possessions and saying farewell to all their friends, including Lieutenant Vignoles, Dr Cotter and his family embarked on the barque Rookery on March 6th, 1841 for the four month journey to Britain, arriving off Deal on 28th July. In the weeks before departure there was a legal tussle between Captain Bourne of the Rookery and Mrs Watts, one of the passengers, regarding payment of £70 for passage, Judge Willis presiding and finding in favour of Captain Bourne. Frances (or Fanny as she was called) was two years and two months and Helena had just turned one. Inez was pregnant with her third child, Charles Henri, from whom we are descended. There was always some confusion over the place of his birth as his death certificate Research 7-2 says he was born in Cork, Ireland, but in the 1851 Census Research 7-3 Inez states he was born in London. However recent (2017) research Research 7-3b shows that he was born in Clapham, London on 18th November 1841, just four months after their arrival and baptised in the Parish of St George, Hanover Square on May 23rd 1842. The 1851 census records that his younger brother Francis Henry Durell Cotter was born on 30 July 1843, also in London. It is at this point in the story that things become quite complicated. Whether there had been an affair between Inez and Lt Vignoles in Melbourne is speculation, but the certainty is that they knew each other there. The shipping records show that Lt Vignoles left Melbourne with the 28th Foot Regiment in December 1841 and went to Sydney and then to England where he arrived on 3rd September 1842, just fourteen months after Barry and Inez. He lived in Chatham, south of London in the Army barracks and he held the position of manager of the 28th Foot Depot, which meant that he was permanently in Chatham. He was made a Captain (by purchase) 21 April 1843. Meanwhile where were Barry and Inez and family living? It could have been London as ten years later, in the 1851 census, Inez gives the birth place of both Charles Henri and Francis as London in 1842 and 1843. Or it could have been Millstreet- Even if his mother had passed away, Dr Denis O’Connell lived there until 1867, and Barry had other relatives in the area, his sister Elizabeth and brother Daniel. The Famine was to rage in Ireland from 1845-1852, but there were several years of potato crop failure beforehand, so it is unlikely that Ireland was their permanent home. 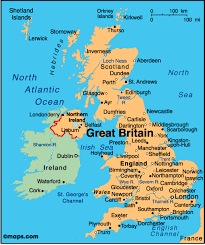 Or they may have gone north to Yorkshire where the Fitzgerald and Fitzwilliam families had their homes. The author of the Satirical Manuscript places Dr Cotter in London in 1841 when he met him by chance. The reference to the Panama Canal is interesting as work did not begin on it until 1881 and it was not completed until 1914. In 1841, Dr S being in London met Cotter in a Blackwall Buss – as far as he could make out from him, (it being after the Luncheon) Dr Cotter had been presiding at a Meeting of City Men to consider a Scheme for Crossing the Isthmus of Panama but whether by a Canal or Railroad Cotter was too “muzzy” to explicitly explain. What we do know, however, is that Dr Cotter left London alone on the Argostina, as ship’s doctor to Launceston Research 7-4 and then arrived back in Melbourne on March 30th 1843. Coming without Inez and the family indicates, perhaps, that he left in a hurry, having heard about the depression which had hit Melbourne and rushed back to save what he could of his finances. He found that he was financially ruined having left power of Attorney with an agent (Inez’ letter of 1863). How he spent the next year is largely undocumented but we have one newspaper report from this period which shows him to be distraught with his financial loss. He was charged with assault after he attempted to gain access to the house in Bourke Street, breaking down the fence and destroying fruit trees and assaulting the occupier of the property. The newspaper report read here comments on the sympathy that the judges showed for his situation and also his stubbornness in the payment of the fine. We know that while he was in Melbourne, Inez gave birth to her fourth child, Francis Henry Durell Cotter on July 30th 1843. The name indicates that at this stage Captain Vignoles was definitely on the scene. Durell was his mother’s maiden name, and part of his own name, and as Barry and Inez already had Frances, it seems odd to give Francis as the child’s first Christian name. According to the dates either man could have fathered the child. Francis arrived in September and Barry left in December and the baby was born the following July. On the other hand, it could be that Captain Vignoles was simply the godfather to the baby, and giving the name as such. How Barry was feeling we do not know, and whether he was even aware that another baby had been born, we do not know. However, it seems he was keen to return to London as he boarded the Isabella on 22nd June 1844, having spent just over a year in Melbourne. This was an ill-fated journey, however and one which, perhaps, marked a turning point in the entire story, as it meant that two more years were to elapse before he saw Inez again. The Port Phillip Gazette (3 July 1844) published this very detailed description of the shipwreck of the Isabella on the Furneaux group of islands, in Bass Strait. I have included this ver batim as the picture it gives of Dr Cotter is so valuable. The ship sailed in heavy weather and by the 20th was still in a strong gale blowing west-south-west. An opening was sighted in the land and the Captain thought it was Kent’s Group and headed towards it. 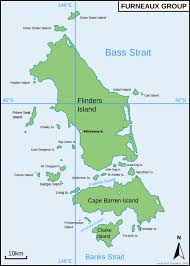 It was apparently Mount Chappell on the larbord and Badger Island on the starboard. The chief mate, Mr Legg, of whom all who were on board speak in the highest terms, here remonstrated with the Captain saying that the course was wrong and suggested the necessity of casting anchor where they were. The Captain in reply told his advisor to hold his tongue and persisted in bearing for the passage. The chief mate, crew and passengers, seeing that no time was to be lost applied to Dr Barry Cotter, the surgeon of the vessel, to know if in his opinion the Captain was sane, and if it was safe to leave the vessel under his direction. Mr Cotter without hesitation replied that the Captain was insane, and totally incapable of managing the vessel. By general concurrence the captain was deprived of his command, which was transferred to the Chief Mate. 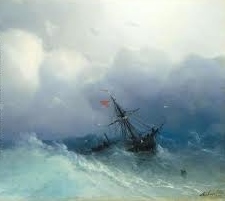 The vessel drifted between two reefs of rock ….with the waves rising and falling around her like leviathans, heightened in their commotion by the effects of a tremendous gale. 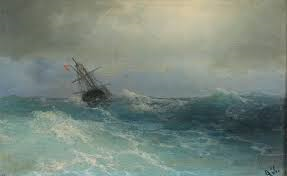 At 3 o’clock on Friday the wind came on in terrific squalls, the rigging strained and cracked like whipcord, tearing the tacking from the bolts. Both anchor cables were run out to their full length of one hundred and ten fathoms. About half past six the following morning the ship grounded on some rocks and the boats were got out. Captain Hardie was the first man to abandon his vessel and hurriedly entered the long boat preceding the ladies and children who were then lowered into her. The cutter containing four men and one of the passengers broke adrift and drifted onshore at Dog Island ten miles from the wreck. 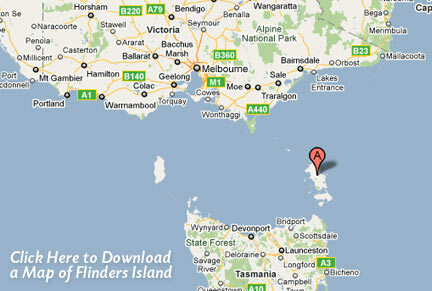 The longboat containing thirteen individuals was ordered to cut her rope and was washedashore on Flinders Island. There were now some twenty persons on the wreck. The dinghy broke away with four men in her. At two o’clock pm, a huge wave lifted her about thirty feet, in her descent she struck with a crash and water immediately made its appearance on the decks while a huge portion on the cargo drifted through the stern. 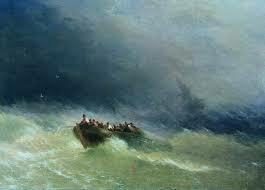 As night was approaching all hands retreated to the forecastle for safety but the sea was breaking over the wreck so with the greatest difficulty they regained the poop and lashed a spar athwart to which all hands lashed themselves. The remaining part of the sufferers were then lowered into the gig – the second mate, Dr Cotter and six of the crew being the last to quit the vessel. This was on Sunday afternoon at four o’clock. At six o’clock the same night the squalls increased to perfect hurricanes, when the wreck broke into four pieces, the poop being the only piece that floated ashore. On the following morning every vestige of her had disappeared. The state of the passengers was most deplorable; their clothes were saturated with water and all they possessed was on their backs. They had no fire or shelter against the severest weather, the only food they could gather was a few pumpkins which had been washed ashore and some limpets gathered from the rocks. On the following morning a party launched the gig and pulled for Woody Island to find the cutter. They found a sealers hut where they were fed and the sealers went with them to Dog Island where the cutter was seen lying on the beach. The gig returned from Woody Island with provisions. Over the next two days all were removed to the sealers hut. They were received by the sealers with the greatest kindness and experienced the most liberal hospitality. Mr Broadfoot and six hands found the ‘Flying Fish’ with Captain Clinch and accompanied by the chief mate went seventeen miles to the aboriginal settlement run by Dr Milligan who supplied them with five sheep and other stores. Mrs Milligan sent boxes of dresses, linen and bonnets. The only person who suffered any bodily injury was McNeil who had a serious head gash from being hit by a spar – he had previously thrown overboard a bag containing sixty sovereigns. The greatest sufferers were the chief mate and the carpenter who had invested the cargo. Subscription lists are now lying at Messrs Harris and Marks, Spence, Cashmore, Williamson and the two banks. The passengers on the wreck were: Cabin John Broadfoot Esq, the charterer, Dr Cotter, Messrs Campbell, Hunter and McNeil, Mrs French and child, Mrs Haulie and Miss Scott. Intermediate: Messrs Ewart, Cuffin, Roach and Davis. Capt. Hardie, chief mate Mr Legg, Second Mate, Mr Menzies and Purser Mr Kincaid. The crew consisted of twenty five hands. The vessel was wrecked on a reef on the south east side of Woody Island sixty miles out of the proper course. The only property saved from the wreck were two chronometers, the ships register, and some nautical books, a few casks of tallow were washed ashore. So, now he had really lost everything. All his personal possessions, even his copy of his medical qualifications had been lost in the shipwreck and without it he could not practice. He probably wrote to Inez to tell her of the shipwreck, because obviously his plan to return to the United Kingdom would be delayed until he could arrange his affairs, earn some money and get a position as ship’s doctor on another voyage. The shipping lists show two entries for Dr Cotter going to Sydney, presumably to have his medical qualifications re-issued. One is on the Coquette on 23 August, 1844 and the other is on 27 September 1844 on the Martha and Elizabeth. Finally, on 25 January 1845 the Medical Board in Sydney re-issued his medical papers and he was registered to practise in NSW (no 270) after stating on affidavit that he had obtained his LFPSG but the certificate had been lost with all his belongings in the wreck of the Isabella. (Medical Museum of Melbourne – University of Melbourne). The Australian Encyclopaedia places him in Goulburn in 1845, but no other evidence of this has been found. The fact that baby Francis was baptised at Manchester could indicate that Inez and the children went to Yorkshire after Dr Cotter left for Melbourne. The Cathedral was used by parishioners in nearby parishes because it was cheaper.However, the following evidence shows that it was less than a year before she headed south to Chatham. In April 1845 Captain Vignoles was ordered to prepare a contingent of the 28th Foot Regiment to leave for India (Allen’s Indian Mail 5 April 1845). Inez must have been distraught at this news because she was already four months pregnant with his child. She was living with him as Mrs Vignoles in Ordnance Row, Chatham, at the Army barracks, along with her four children. The baby, Inez Seville Vignoles, was born 2nd July 1845 to Inez Seville Vignoles formerly Fitzgerald and Francis Durell Vignoles, Captain 28th Regiment, Ordnance Place and was registered by her mother on 21st July 1845. (Entry No. 409, 1845 Sept, Medway, Vol 5, page 371). Three weeks later on July 29th, 1845, seventy eight men of the 28th Regiment, with their Captain, Francis Durell Vignoles, left Gravesend aboard the Claudine for India, arriving in Bombay on 23rdDecember. Inez was never to see him again. Dr Cotter did very well to be ready to return to the United Kingdom within the year. On 15th April 1846 he is listed leaving Sydney as a passenger to London on board the Dublin arriving probably in August. Whether he knew about Inez’s and Captain Vignoles’ baby is unclear, but he would have arrived to find her in mourning. 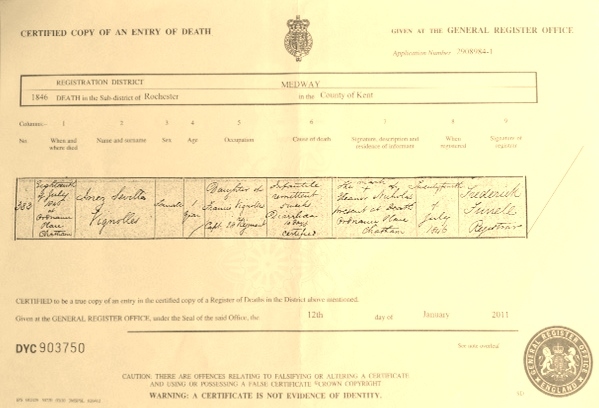 The baby’s death certificate states that she died on 18th July 1846, aged 1 year, of Infantile Remittent Fever which she had had for five weeks accompanied by diarrhoea for two weeks. A remittent fever is a fever pattern in which temperature varies during each 24-hour period but never reaches normal. Most fevers are remittent and the pattern is not characteristic of any disease, although in the 19th century it was considered a diagnostic term to describe the condition rather than, as we know today, the fever being a symptom of an infection. Baby Inez had been baptised three days before her death at St Mary’s Chatham, Kent. Dr Cotter was in the United Kingdom for less than a year. How long he spent with the family is unclear, but Inez remained at the Chatham address at least for the next six years. Perhaps he went back to Ireland again as well, but obviously was discontent with life in the old country and headed once again, alone, back to Australia. He arrived in Adelaide as ships’ surgeon on the Royal Georgeon 24th June 1847.